When is someone competent enough to work without supervision? Inadequate supervision and training is often a major factor in workplace injuries suffered by inexperienced employees. What the key steps are. What dangers they face with the activity, machinery or process. How to avoid these dangers and keep others safe as well. 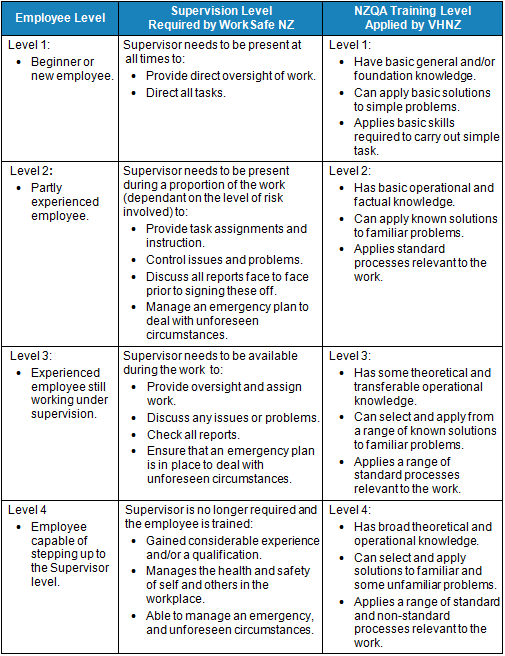 Give the employee clear printed SOPs, job instructions and/or checklists to follow. Slowly and clearly demonstrate the activity. Ask the employee to explain the activity back to you. Let the employee run through the activity slowly. Check on the employee periodically to make sure they are working safely. VHNZ follow a training cycle that reflects this process: VHNZ Explain and Demonstrate a behaviour and then ask trainees to Imitate and Practice this behaviour (EDIP). Despite the clear direction provided by WorkSafe NZ, it was easy for training needs to be lost to competing demands. Supervision lapsed and risk soared. The new Health and Safety at Work Act (2015) will require a person conducting a business or undertaking (PCBU) to provide any "information, training, instruction, or supervision necessary to protect all persons from risks … from [the] work "... Training will be prescribed by a number of the regulations and can be ordered by the regulator. Training will form part of the engagement a PCBU must have with its workers. Most importantly VHNZ becomes an upstream PCBU under the new Act and 'must' work with you to ensure employees are trained to do the work they are being trained to do safely. As an a upstream PCBU we can work with you to assess what skills and training employees need and assure you when they have been trained to work without supervision. VHNZ can give PCBUs confidence of employee competency and a certainty about when they can relax supervision requirements.